We are moving into my favourite time of year, Autumn in Victoria. The heat is still with us, but there is a crispness to the air which speaks of the fine sunny days and cool clear nights. I have painted one of my favourite summer flowers Hydrangeas. My mother always had Hydrangeas growing and I loved their great blousy flowers that glowed in the summer shade, reminding me that there were still cool greens around. But as we move into autumn the blues are touched with a purple as they slowly fade. This was a great deal of fun to do, it is small for me 30cm square and it was a challenge to move the colours in the petals through from yellow, to blue and then purple. There are some really lovely parts of this painting where the colours really sing. My thoughts when I started this was to do four different hydrangea pictures, I am going to start on my second now, so I might make it. I was just going to ask you what medium you used but I see you have written coloured pencils amongst the tags. It really looks like paint. Lovely! I like hydrangeas too – grew well in Wellington where I come from (so wet) but here in dry old Perth, you wouldn’t grow them because too much water needed. Karen, I like your colors and the transitions you achieved, making the colors sing! My eye wants to burrow down in the petals like a bee and explore each one. A couple of little things: Did you intend to leave that single petal all yellow in the upper center? Especially with the dark purple petal behind it, it seems to draw more than its share of attention. Also, I don’t think your background color enhances the flowers. It’s too close in value and hue to the flowers. You do so well with your compositions and negative spaces that I’d like to see this area a darker, more purply-green, the color of the hydrangea leaves perhaps. But these are little details, mostly my personal preference. 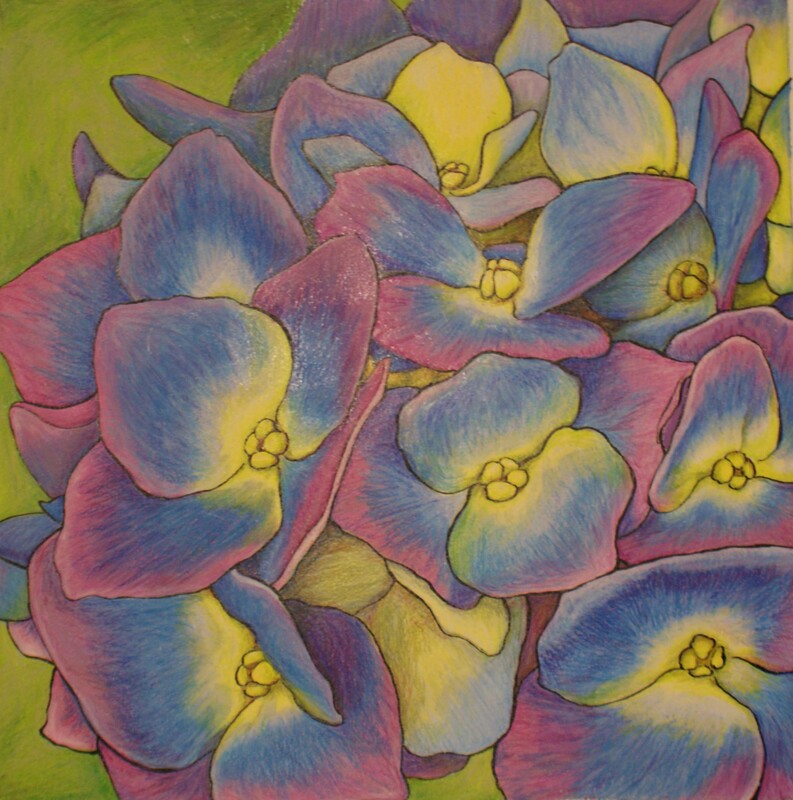 Looking forward to seeing the other paintings of hydrangeas! Hi Ruth, Thank you as always for your comments, they really make look again and give a different perspective to my work. They are greatly appreciated. Both the things you commented on were areas of the painting that I did spend some time considering as I knew they coud be problematical. The yellow petal works better in the original, I had a lot of trouble with the image for the website last night, it isn’t the best quality, I could not get to my normal scanner so it is a photo. I did consider changing its colour but I do like the surprise of it and it stops the petals being too much the same. I always like the different individual. The green background was chosen to blend in with the flowers as I wanted the background to to merge in with the flowers and to just give the hint of the cool green of its leaves without too much detail. The drawing is deeply moving. This one seems complete to me: is it?